This top depicts a sparrow’s nest. According to Hiroi-sensei, sparrows are said to make their homes in bamboo groves. 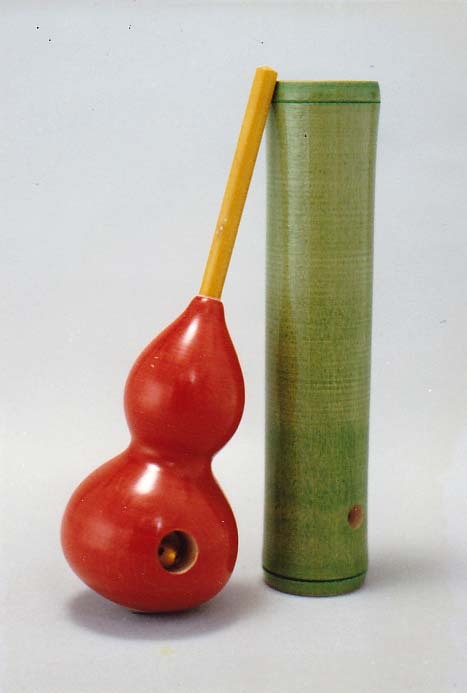 Here we see a stalk of bamboo and a gourd. The sparrow has opened a hole in the gourd to make a nest and pokes his head out from inside. Hiroi Michiaki: And… This is, ahh—the dwelling of the sparrow. Umm, I’m not sure why, but umm, in bamboo groves there are many sparrow nests, um, this gourd, when it hangs down like this, they open a hole in it, and then the sparrow sets up a nest in there. I don’t know how it is in reality, though. (laughs) And that’s the sparrow’s dwelling. Mrs. Hiroi: From that hole there, [the sparrow’s] mouth pops out, going pi pi pi.